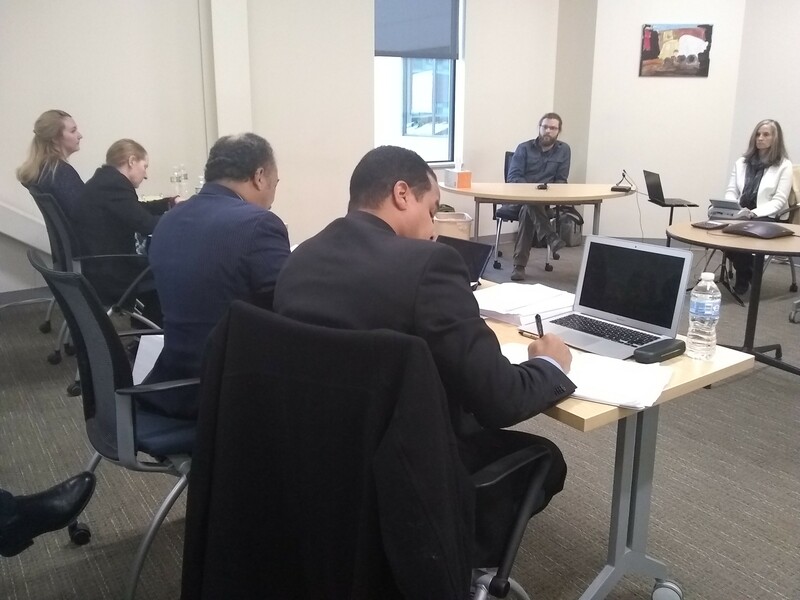 Lance Smith (center, facing camera) testifies before Mario Macias (near right) and his attorney, Francisco Guzman (left). Ex-Burlington High School guidance counselors on Thursday described a "toxic" and "emotionally unsafe" work environment under their former boss, Mario Macias. 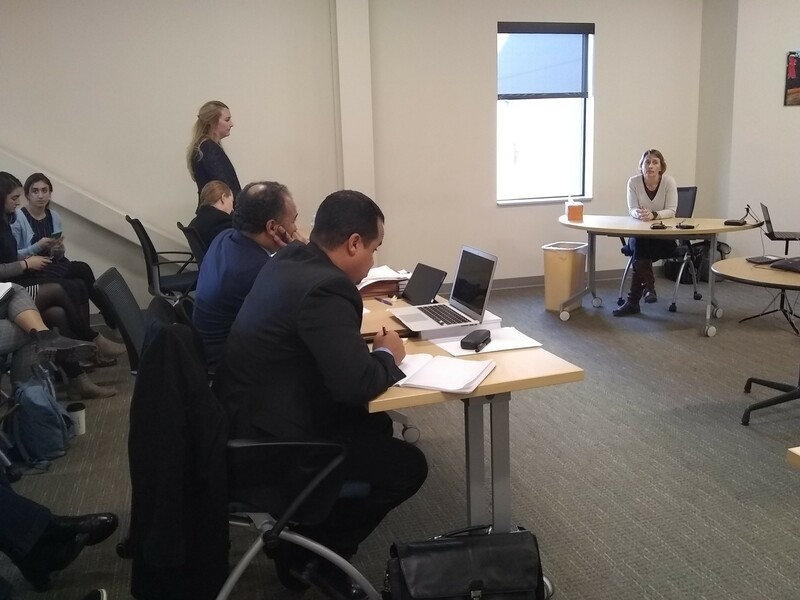 In a bare conference room at the Agency of Education headquarters in Barre, a three-member panel, comprised of two school administrators from other districts and a member of the public, listened to a full day of testimony from BHS educators, a student and a University of Vermont employee. It was the second day of hearings involving Macias and will continue on Friday. Following a yearlong investigation, the Agency of Education in September cited Macias, the BHS guidance director, for allegations that include: falsifying a student transcript, creating a hostile work environment, behaving inappropriately with a college student and impeding the investigation by "inappropriately engaging" a student witness about the charges against him. Macias, who was hired in the summer of 2016, was placed on administrative leave in September 2018 pending the conclusion of the investigation. The Agency of Education, which laid out its case on Thursday, has recommended revoking Macias' license. The panel is expected to return a decision in early 2019. Macias did not take the stand Thursday but is expected to testify in his defense on Friday, according to his attorney, Francisco Guzman. Emily Simmons, an attorney for the education agency, called forward a series of witnesses on Thursday who described a poorly managed guidance department and an emotionally unstable work environment. Yvette Amblo-Bose, who worked as a BHS guidance counselor for 20 years, described a department meeting in which Macias jumped up and jabbed a finger in her face. "You are the problem; you need to stop asking questions," she recalled him telling her. "You are the problem in this department." "I cried a lot at home; I dreaded going to work; I felt unsafe," she said. Amblo-Bose also said she had "serious concerns" about the guidance services and safety of the kids during Macias' tenure. Larissa Urban, who worked in the department at the time, described an "extremely uncomfortable and scary" environment in the guidance office. Both Urban and Amblo-Bose quit after Macias' first year. Another counselor, Simrat Peltier, started in the fall of 2017 and said the stress and fear of the job ultimately led her to start taking antidepressant medication. Guzman, Macias' attorney, wrote off the testimony as a difference of opinion about how the department should be run. Guzman, in questioning the state's witnesses, turned confrontational at times, saying at one point that Amblo-Bose was "challenging the director at every given turn," and that she "ambushed [Macias] by wanting him to switch his office." Other witnesses, though, painted a bleak picture of a department in disarray under Macias' leadership. Burlington math teacher Marcel Girouard said the Advanced Placement board had investigated the school because Macias had let students talk and draw on the whiteboard during AP exams, contrary to College Board rules. And in 2017, UVM stopped placing its masters degree counseling students at BHS because it "wasn't an environment for students to learn the skills ... and disposition of school counselors," according to Lance Smith, who oversees the program for UVM. The panel is expected to issue a decision on the case in early January.